The Connecticut House of Representatives being sworn in on the first day of the 2019 legislative session. Many, if not most, state legislators work elsewhere to bolster the paychecks they earn at the State Capitol. The annual base pay is $28,000 and goes up to $38,689 for the House Speaker and Senate President Pro Tempore. So a second income helps. But with outside employment comes real or perceived conflicts of interest, whether allowed by the state's loose ethics rules or not, when lawmakers take part in decisions that might benefit their occupations or their places of business. Would going to a full-time system mitigate that? Would the higher pay entice more people from different backgrounds to serve in the legislature? For states that have full-time legislatures, are there noticeable benefits? 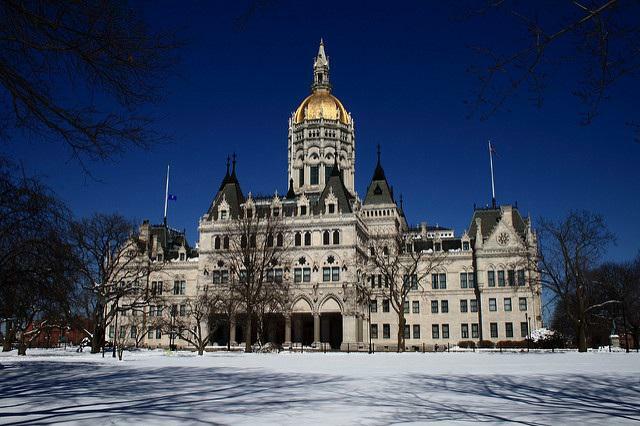 Hartford Business.com: Hartford Dysfunction Underscores Need For Full-Time Legislature - "Our part-time state legislature has proven time and time again it's unable to grapple with the complexities of state government." Raising Hale.com: A Full-Time Legislature Would Mean Full-Time Trouble For Connecticut - "A full-time legislature would merely allow the self-serving more opportunity for personal gain." Chion Wolf and Lydia Brown contributed to this show. Democratic legislative leaders in Connecticut want to legalize the recreational use of marijuana this year. They say the taxes generated from such a move would bring in as much as $100 million a year.